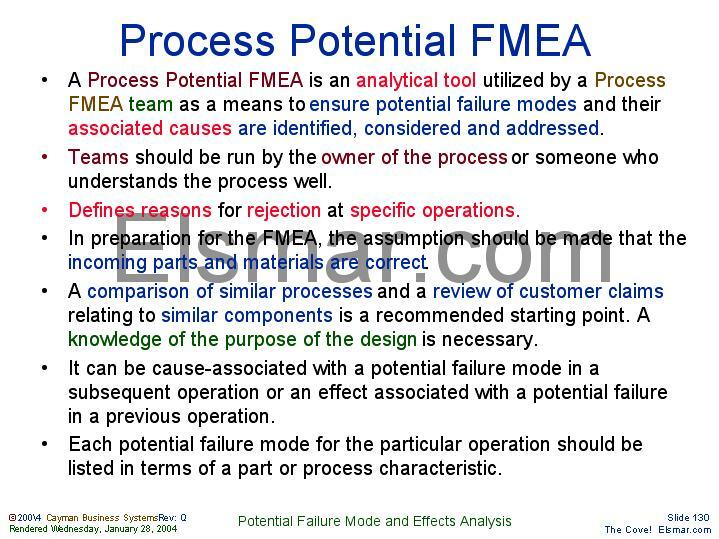 A Process Potential FMEA is an analytical tool utilized by a Process FMEA team as a means to ensure potential failure modes and their associated causes are identified, considered and addressed. Teams should be run by the owner of the process or someone who understands the process well. Defines reasons for rejection at specific operations. In preparation for the FMEA, the assumption should be made that the incoming parts and materials are correct. A comparison of similar processes and a review of customer claims relating to similar components is a recommended starting point. A knowledge of the purpose of the design is necessary. It can be cause-associated with a potential failure mode in a subsequent operation or an effect associated with a potential failure in a previous operation. Each potential failure mode for the particular operation should be listed in terms of a part or process characteristic.